Understanding and Addressing Exhibitionism in Java Empirical Research about Method Accessibility is now online! Matías Toro successfully defended his MSc thesis! Congrats!! Oscar Callaú successfully defended his PhD thesis! Congrats!! Esteban Allende successfully defended his PhD thesis! Congrats!! Paper on Foundations of Typestate-Oriented Programming (Garcia, Tanter, Wolff, Aldrich) appeared in the ACM Transactions on Programming Languages and Systems! Paper Understanding and Addressing Exhibitionism in Java: Empirical Research about Method Visibility (Vidal, Bergel, Marcos, Andrés) accepted for publication in Empirical Software Engineering. Paper On the Use of Type Predicates in Object-Oriented Software: The Case of Smalltalk (Callaú, Robbes, Tanter, Röthlisberger, Bergel) accepted at DLS 2014! Felipe Bañados successfully defended his MSc thesis! Congrats!! Paper on Confined Gradual Typing (Allende, Fabry, Garcia, Tanter) accepted at OOPSLA 2014! Rodolfo Toledo successfully defended his PhD thesis! Congrats!! Ismael Figueroa successfully defended his PhD thesis! Congrats!! Romain Robbes will participate in the Dagstuhl Seminar on Software Development Analytics, June 2014. Éric Tanter will participate in the Dagstuhl Seminar on Scripting Languages and Frameworks: Analysis and Verification, July 2014. After nearly 5 years of hard work, the book Deep Into Pharo is out! Ismael Figueroa is PC member of Modularity 2014! Éric Tanter is now Editor-in-Chief of the LNCS Transactions on Aspect-Oriented Software Development. Ismael Figueroa won the ACM Student Research Competition at the AOSD 2013 conference, with his work on Taming Aspects with Monads and Membranes! Paper on Parallel Actor Monitors (Scholliers, Tanter, De Meuter) accepted for publication in Science of Computer Programming. Paper on Join Point Interfaces for Safe and Flexible Decoupling of Aspects (Bodden, Tanter, Inostroza) accepted for publication in ACM TOSEM. New INRIA Équipe Associée REAL: Reasoning about Effects in Aspect Languages with Pleiad, 2013-2015 (led by Tanter and Noyé). Paper on Programming with Ghosts (Callaú, Tanter) appeared in the January issue of IEEE Software. Check out the Ghosts website! The paper AspectMaps: Extending Moose to Visualize AOP Software by J. Fabry, A. Kellens, S. Denier, and S. Ducasse is accepted in the Elsevier Journal Science of Computer Programming. The paper Expressing Aspectual Interactions in Requirements Engineering: Experiences, Problems and Solutions by A. Zambrano, J. Fabry, and S. Gordillo is accepted in the Elsevier Journal Science of Computer Programming. Three papers of PLEIAD accepted at FOAL 2012! “A Practical Monadic Aspect Weaver” (Figueroa/Tanter/Tabareau), “A Self-Replicating Algorithm to Flexibly Match Execution Traces” (Leger/Tanter), “Taming Aspects with Membranes” (Tanter/Tabareau/Douence). A.Bergel got his regular FONDECYT project accepted. Period 2012 - 2014. ACM Best Paper award at MODELS 2011 for “Expressing Aspectual Interactions in Design: Experiences in the Slot Machine Domain” by J. Fabry, A. Zambrano and S. Gordillo. David Röthlisberger joined Pleiad as a postdoc. Welcome David! R. Robbes had a FONDECYT project accepted! The paper presenting PHANtom by J. Fabry and D. Galdames was accepted at the International Workshop On Smalltalk Technologies at the ESUG 2011 conference. Paper on Ambient Contracts published in Personal and Ubiquitous Computing. Our paper “How Developers Use the Dynamic Features of Programming Languages: the Case of Smalltalk” won the Best Paper Award MSR 2011! Three (3!!!) papers of PLEIAD accepted at ECOOP 2011! “Gradual Typestate” (Wolff/Garcia/Tanter/Aldrich), “Summarized Trace Indexing and Querying for Scalable Back-in-Time Debugging” (Pothier/Tanter), and “Counting Messages as a Proxy for Average Execution Time in Pharo” (Bergel). AspectMaps, a scalable visualization of join point shadows, version 1.0 has been released. The first release of Hapao, a test coverage tool for Pharo, is now out. É. Tanter has been promoted to Associate Professor. PLOMO: The INRIA Equipe Associée between PLEIAD and RMOD (INRIA Lille) was accepted! 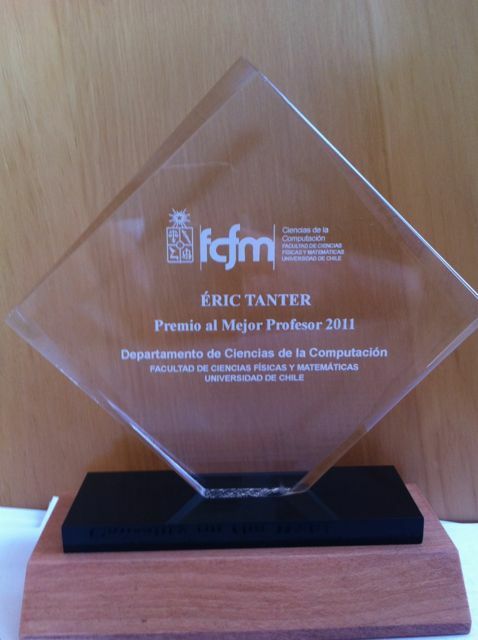 The FONDECYT project of É. Tanter, entitled “Modular and Adaptable Software without Losing Control” was accepted! (2011-2014). The 2011 edition of the Dyla workshop will be collocated with TOOLS EUROPE. Paper on Aspectizing Java Access Control accepted in IEEE Transactions on Software Engineering! R. Robbes is PC member of ICSM 2011, ERA track, and of ESEC/FSE 2011, tool demos track. R. Robbes is PC Co-Chair of IWPSE-EVOL 2011. Talk by Arturo Zambrano on Digital TV in Argentina and the implementation of the middleware for interactivity performed by his team. Slides available here. Paper on Composition of Dynamic Analysis Aspects accepted at GPCE 2010! The code profiling visualization project has been elected by the Smalltalk community to receive a grant from Google. Best paper award at AOSD 2010 for the paper on Execution Levels! Doublé of PLEIAD at AOSD 2010! our papers on AspectScript and on Execution Levels have been accepted! Doublé of PLEIAD at MSR 2010! Our papers Replaying IDE interactions to evaluate and improve change prediction approaches and An extensive comparison of bug prediction approaches were accepted. Our paper Linking e-mails and source code artifacts has been accepted at ICSE 2010. Beyond Static and Dynamic Scope accepted at DLS 2009! É. Tanter is part of the Program Committee of ECOOP 2010. New professor at PLEIAD: Alexandre Bergel has joined the lab! Articulo sobre TOD en la Revista Bits de Ciencias del DCC. É. Tanter is part of the Program Committee of AOSD 2010. Fondecyt project "Engineering and Composition of Domain-Specific Aspect Languages" approved. J. Fabry is Program Committee co-Chair of the 8th International Conference on Software Composition (SC2009), co-located with TOOLS-Europe 2009. Paper on Expressive Scoping of Distributed Aspects accepted at AOSD 2009! Stic-AmSud project CoReA: Comprehension and Remodularization of Applications based on Aspects, Classboxes and Traits, approved. TOD featured at the Vancouver Eclipse demo camp! 4th workshop on Domain-Specific Aspect Languages to be held at AOSD 2009. Best paper award for Controlling Aspect Reentrancy at SBLP 2008! Summer School on Programming Languages, organized by PLEIAD. Paper on Contextual Values accepted at the ACM Dynamic Languages Symposium 2008! Articulo sobre PLEIAD para la nueva revista del DCC | article about PLEIAD for the new DCC magazine. Paper on Expressive Scoping of Aspects at AOSD 2008! Demo on Omniscient Debugging of Aspects with TOD at AOSD 2008! 3rd workshop on Domain-Specific Aspect Languages organized at AOSD 2008. Paper on Omniscient Debugging for Aspect-Oriented Programming accepted at SAC 2008! Slides of the Talk of Ron Goldman (Sun Microsystems Labs) available on What Everyone Should Know About Open Source.